As Four Corners reveals the true stench behind the Adani Coal Mine sponsors, there remains a gaping hole in the saga. Where does the ALP stand and why are they not shouting blue murder from Canberra? An assurance from the ALP that the mine contracts would be nullified is feasible given the Adani background already known. If the ALP fails to join the campaign proper this signals the outright corruption of federal politics across major parties. Australia has seen the ALP double cross Australia on so many occasions relating to its position on Uranium Mining and Nuclear Waste. Are we going to see the same scenario emerge in relation to this mega mine which is set to devastate the Great Barrier Reef and prime agricultural land? 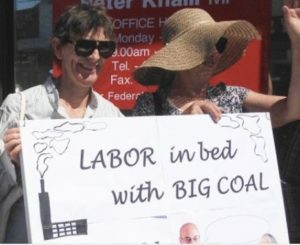 Federal Labor has been at odds over Adani for months, with members of the left faction against the mine development. Mr Bill Shorten said he would support the mine if it “stacked up” commercially during an April visit to Townsville, one of the Queensland regional centres set to boom under the Adani deal. On the same trip, Mr Shorten attacked a proposed $900 million loan to the company under the Northern Australian Infrastructure Facility to build a rail link through the Galilee Basin to the Abbot Point coal terminal port. 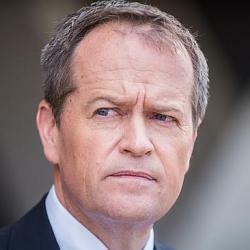 “I am not convinced the taxpayer of Australia should underwrite the risk of the project through a billion-dollar loan,” Mr Shorten said in reference to the proposed loan. A protest was then reported in July at Bill Shortens Office highlighting the same point. What is the ALP snake in the grass up to and why is not performing an opposition role in the wake of the widespread protests? Bill Shortens Office made no comment? Protester Michael Staindl said the Labor opposition was taking a “low profile” and “sitting on the fence” on the controversial mine project. “We need them (Labor) to take a much stronger stance on this,” the 64-year-old said. He said the people of Queensland had been misled by the promise of jobs, which would instead cost coal jobs elsewhere in Australia. The businessman said he was happy to risk arrest to protest against the coal mine. “Ten years ago, I’d have never done something like this, but it’s important and we need to focus on renewables not fossil fuels,” he said. Here in lies the problem facing Australia. There is no opposition as demonstrated by the weak kneed null position of the ALP on this so evidently corrupt mine process and equally corrupt process by which it is gaining approval. Yet again, the Australian media is revealing the stench and yet failing to ask the obvious questions.